Tennessee Valley Surgery Group, P.C. Dr. Bailey, Dr. Phillips and Dr. Desselle are Board Certified Diplomates of the American Board of Surgery. Each has acquired specialized knowledge and experience related to the diagnosis and treatment of surgical conditions, including preoperative, operative and postoperative patient care and the management of complications. Our surgeons offer a minimally-invasive approach to procedures such as hernia repair, appendectomy, breast biopsies and other common procedures. Each surgeon specializes in a broad range of procedures, including, but not limited to, breast, thyroid, abdominal, hernia, and rectal procedures, as well as Endoscopic procedures. To view a more detailed list, please view our link. 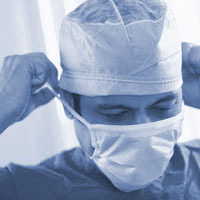 Our surgeons take great pride in providing the best possible surgical care to their patients. This is evidenced by the high quality of their work and friendly service to their patients. You are invited to learn more about our surgeons by viewing their picture and Curriculum Vitae on the website. ©2017 Tennessee Valley Surgery Group, P.C. All Rights Reserved.